It is nearly 30 years since I Cnished school, so I think it’s now safe to confess: I was the one who used to swap my classmates’ lunches – placing one’s sandwiches next to the other’s paratha and the other’s subzi next to the one’s green coriander chutney. My only hope is that while many may curse me, some might want to thank me! 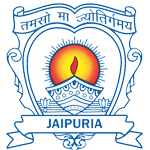 Joining Jaipuria was perhaps an act of providence for me. I remember having written an entrance exam - a daunting prospect since Jaipuria was known for its high standards - in the middle of the term. Jaipuria was where the elites and the well-heeled used to send their children and I belonged to a family that had humble roots. After all, the school offered horse-riding as an activity! I clearly remember being conscious of my background during my early days but our teachers went the extra mile to encourage all to participate in school activities by following a ‘House’ system, and this helped make me much more than I would have ever been – a studious geek. On my end, I made up for my sense of embarrassment by participating in sports and extra-curricular activities such as debating, speaking extempore, theatre, and dance and coming tops in all contests. I belonged to the Godavari House and I remember us winning more often than losing! I would proudly wear that yellow shirt any day. It was mandatory for every student to be a part of an activity and that of a society as well. My chosen activity was food preservation and I made many a jam with fruits in my heyday, most of which I consumed myself. I remember proudly delivering speeches at the Independence Day and the Republic Day celebrations every single year that I was in Jaipuria. Today, when I Cnd joy in giving motivational speeches to corporate honchos, students and trainees, I know whom to thank. I also got a lot of mischief done, all quite innocently, though. I remember bunking Scouts sessions to go play table tennis with likeminded friends and then hiding at improbable places to avoid being discovered by some vigilant teacher. Our then VicePrincipal Mr Arvindakshan kept this ‘wild side’ of mine in check; he’s the one who wielded a cane up his sleeve and I distinctly remember getting a lick or two – things that wouldn’t Cnd favour in today’s time. All I know is, thankfully for him, I checked myself! Going to the canteen during the lunch break was almost a ritual for me; two samosas and cold-drinks every single day. Mr Y Gupta helped us develop strong fundamentals in physics, which stood me in good stead when I was pursuing an engineering degree. Mr M C Gupta’s emotionally charged rendition of the Sankshipta Ramayana I Cnd unforgettable; although, in our childishness we gave him the moniker, ‘Maa Sita’, as he chose to respectfully refer to the character in the epic, also a deity in the Hindu pantheon. What felt funny then I have grown to respect now; so much so that I try to infuse the same passion in my Leadership Through Literature classes at the Indian Institute of Management-Lucknow. In the last three decades, I went from collecting an engineering degree to joining Tata Steel (Jamshedpur) as a Graduate Trainee at the age of 21, where I had an eight-year stint through Operations, Engineering, and Corporate Communications departments. I also became a quiz master, a Master of Ceremonies, even represented Bihar at state-level snooker championships, had the chance to interact with and learn from iconic personalities such as JRD Tata, Bachendri Pal, etc. My involvement with Tata Steel Adventure Foundation made me fall in love with mountaineering and it is on one such trip on the Himalayas that I had an epiphany and went back to school at Indian Institute of Management – Ahmedabad for a fellowship. After completing my doctorate here in ConGict Management and Negotiations, I joined XLRI Jamshedpur and taught Human Resources there for a year, before Cnally joining IIM-Lucknow, where I have been for almost eight years now, teaching courses such as Strategic Business Management, Leadership through Literature, and Justice, Ethics, and Morality. I am now about to take leave for two years and go to Mumbai as the Dean of the India campus of SDA Bocconi School of Management, Milan, Italy. If I know one thing for sure, it is that a happy adulthood thrives on the spoils of a joyful, constructively spent childhood and I have to thank Jaipuria for every bit of that.